As promised, I said that I would follow up on my opinion with the testing of both the Lindsay Palm Control and the GRS Airtact. I have had both in my possession for the last month both at my home business and at Browning Arms. Let me start off by saying, I must give credit where credit is due. Glendo Corp (GRS) has come up with a neat design to try to compete with the Lindsay Palm control. The set up was not bad once I receive all the right equipment. As I stated in an earlier thread, I had a little trouble with getting the right accessories. Note to those who may want to try out the Airtact: make sure you are clear when ordering the airtact which machine you are using and what hand piece you are utilizing. The Airtact worked. I think that is all we can positively say about it. I say we because there was six of us at Browning that all share the same thoughts, experience and opinions. We had a lot of trouble controlling it at first until we adjusted the air pressure on the Airtact machine. Once we learned how to do that, controllability got a little better. We found that after a period of time of engraving (a few hours) that the hand piece is inevitably going to move. Once the hand piece moves, the sensitivity which you spent a period of time trimming to your liking, changes drastically. Sometimes when the hand piece moves in your hand it seems as if you get a huge burst of air and oops, you just found yourself figuring out how to cover up a mistake. I am curious, when GRS comes out with hand pieces that are capable of more than 4000 SPM, what is going to happen to those people who are using the gravermax and those using the airtact? Will those people have to get a new machine or new Airtact attachments? Will the new hand pieces have enough power? I guess having the two machines to operate the Airtact isn't all that bad. We just like the simpleness of the Lindsay Palm Control. There is only one small tube coming directly from the air source. Every other adjustment can be made right on the hand piece. Another great point about the Lindsay Palm Control is, you can use almost any source of air whether it be CO2, compressed air (like a scuba tank), air compressor or heck put the tube in your mouth and use your lungs! The Lindsay Palm Control puts an unbelievable fun feeling back into engraving. You get gorgeous cuts with the capability of going up to 15,000 SPM. We Found with the Airtact it was like having a restriction not allowing us to go over 35 mph in a 70 mph zone. We really like only having to have one hand piece. The Lindsay Palm Control has a adjustment ring on the hand piece to control the stroke length witch is even a lot finer than the Monarch. It really does make a unbelievable difference. The more you push the faster it goes. You don't need to use a push tool anymore. You can do spectacular exhibition shading with the Lindsay. When you get to that certain depth of shading where you need caution, power magically appears with the Lindsay Palm Control. If your worried about the capability of "plucking, popping, flicking" we found that both Lindsay and GRS equipment responded the same. Browning Arms Company will be purchasing a Lindsay Palm Control and Foot control. The results are 6 in favor of the Lindsay and 0 in favor of the Airtact. If you are stuck financially You will do fine with the Airtact. But I seriously suggest you find a way to give the Lindsay Palm control and honest try. When you ultimately spend thousands of hours with a particular tool in your hand, and your livelihood may very well depend upon it, it makes zero sense not to get the finest. The Art is booming. There are so many new engravers these days, myself among them, that don't/didn't know there is an alternative to GRS. I am glad I found out otherwise with some research before putting my hard-earned $$ towards my equipment. 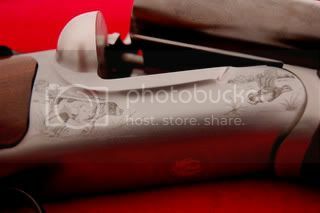 I'm currently engraving an A-5, the gun with the "hump back". As you might know, holding this gun in a ball vice to engrave the back side is kind of a pain. So I quickly detached my palm control from my compressor, capped off the tube, reattached it to my CO2 and moved to my stand up hammer and chisel vice. DO THAT WITH AN AIRTACT!!!! I don't think so. Maybe I'll go to McDonalds with my equipment and engrave and tell the customers that Micky Dee's is now offering "chips"! I have to agree with your opinions of the two systems I have also tried the tools from both and have chosen the Lindsay line. I now have a foot-controled classic and a PalmControl classic and have never had even a moment of regret. I made the right choice for my needs. Last edited by Rich Hambrook; 08-27-2007 at 05:48 PM. Beautiful work Rich. I'd love to see more. Fabulous work Rich. It even looks Belgique, hehe. Good job my friend. 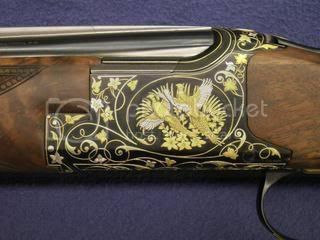 Damn I wish I could engrave like that...maybe in the next lifetime. I meant to add this to the post that was referred to on the Cafe' but never did, so I’ll add it here. My infringement comments on that post were meant to shed light on why we customers are angry to a point about this. All the work a guy puts into an invention in the way of money, time, patenting, then manufacture should count for something. Then the competition comes along, copies its concept after it’s patented and then thumbs their nose arrogantly as though patent law doesn’t apply to them and spreads negative press about the others product to promote their own copied version of the tool. I heard these negative press comments first hand and felt it was very unprofessional and said so to them directly. Despite this attempt to pursuade them to correct their tactics nicely, GRS and their employees continue in this misinformation to try to tear down the appeal of the Palm Control tool and promote their version of it. This type of flippant corporate attitude toward this sensitive issue creates friction that we all feel until there is a fair and just resolution to it and ultimately closure. We all see this going on and are tired of it for a variety of reasons and justifiably so. Indeed, some engravers have gone so far as to put their own personal boycott on GRS because of it. None of us like to see companies do the wrong thing just for the sake of sales and profit, especially when it hurts anothers business and livelihood. That ever present underlying friction caused by the offensive stance taken by Glendo is the root cause of all this turmoil. That’s my opinion on the whole darned thing from what I’ve read and seen first hand; it’s just plain unethical and folks are sick of it. The sad part is that none of this had to happen if proper ethics were practiced. The other thing I meant to say was that Richard’s original post was a tool comparison and critique report. The thread he started got hijacked and turned into something else by other posters that implied that some newbies think they can become a master engraver magically just because they have one tool or the other and that wasn’t at all the topic and I’ve never read or heard where anyone thought that way. That would be silly. Seems these tool opinion threads get turned around like that often for some reason.